Meyers Nave’s Labor and Employment Law Practice Group consists of attorneys who focus 100 percent of their practice on labor and employment issues. We represent public entities, businesses, non-profit organizations, and public-private partnerships throughout California in the full range of labor and employment advice, counseling, training, investigations, administrative hearings, and litigation in state and federal courts. We provide sophisticated, operations-focused advice on complex issues such as employee classification, discipline and terminations, leaves of absence, workplace culture, social media, disability issues, employee privacy and free speech rights, whistleblower laws, and management of internal and external complaints. We also offer start-up packages to assist emerging companies with templates, handbooks and key compliance structures. Our attorneys are experts in drafting and revising personnel policies, employee handbooks, and employment contracts, as well as conducting audits covering the entire organization or focusing on specific subjects such as hiring practices or workplace safety. When litigation is unavoidable, we have experience defending employers in single- and multi-plaintiff lawsuits involving wage-and-hour issues, wrongful termination, sexual harassment, racial discrimination, disability accommodation, retaliation, defamation, medical leave, and trade secret misappropriation, among others. Our labor lawyers have served as lead negotiator and labor counsel for employers that are involved with labor organizations representing every type of employee—rank and file, management and professional. We handle collective bargaining, contract grievances, unfair labor practice charges, fact-finding proceedings and dispute resolution. Our experience includes preparation and strategy, serving as chief spokesperson at the table, advising on impasse procedures, and briefing management. A key strength of our negotiations practice is our experience litigating and arbitrating the same issues negotiated at the bargaining table. We have handled representation and decertification petitions and advised clients on issues such as permissible parameters of organizational picketing and pamphleting, rules limiting management communication with employees before and during organizational campaigns and elections, proper conduct of elections, and bargaining unit determination. We have had a specialty Workplace Investigations group for more than 10 years, and we have conducted over 250 high-profile investigations on virtually every type of current and emerging workplace misconduct allegation, including ethics violations, hostile work environment, harassment, discrimination, bullying, retaliation, implicit bias, substance abuse and fraud, waste and abuse. We also advise on and supervise internal employer investigations to assure compliance with state and federal laws. Meyers Nave specializes investigations that involve the leadership ranks of an organization—elected officials, Board members, executive officers and management team members, department managers, and key personnel including police and fire chiefs, university faculty, and school administrators. As attorneys who also represent clients in employment litigation, we know how to conduct independent investigations and prepare reports that will withstand scrutiny and credibly serve in a courtroom, arbitration or public domain. 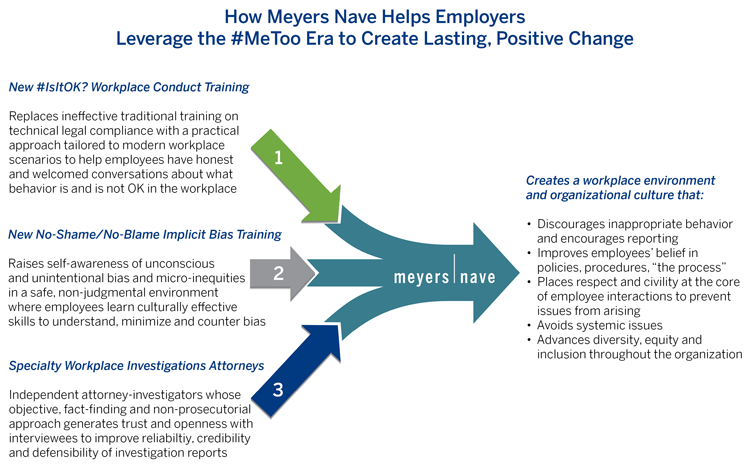 The #MeToo movement revealed that traditional workplace misconduct training that focused on technical legal compliance did not have the intended effect of preventing or stopping inappropriate workplace behaviors. 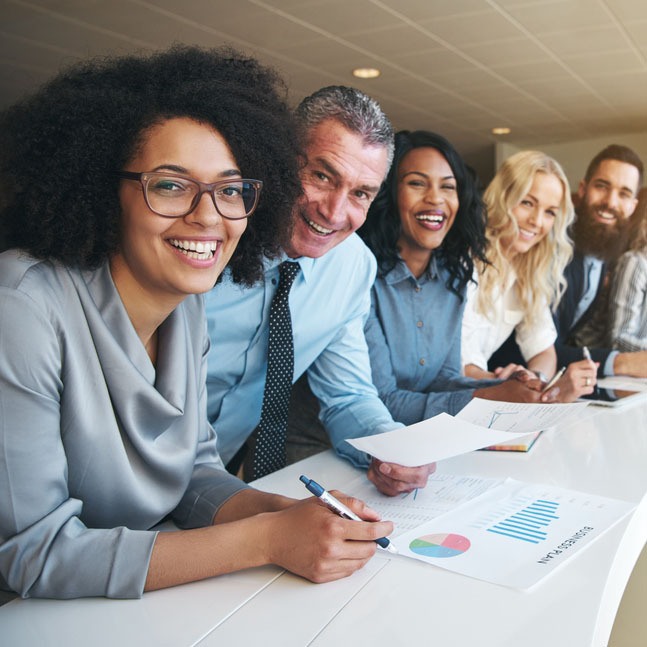 Meyers Nave has created new training programs that enhance workplace culture, incorporate a practical approach and reflect modern workplace scenarios and issues. Our programs provide employees with the awareness, knowledge and tools needed to thrive in today’s complex workplace, including Harassment and Bullying Prevention, Recognizing and Minimizing Implicit Bias, How to Have Inclusive Conversations about Difficult Issues, Protecting Due Process of the Accused while Investigating Allegations, Promoting a Respectful Workplace, and Bystander Intervention Training. Mandatory Arbitration of Employment Claims: Is It Still Worth It? AB 168: Is California Moving Toward Completely ‘Blind’ Hiring? Joint Employment Issues: What Does the Future Hold for Employers?